And then, when I do have something to say and I get it all typed in here, the computer arbitrarily deletes it. I need to buy a new one, but I don’t want Windows 8 and I can’t afford a Mac. So I’ll just muddle on with this one. This winter has been very, um, sucky? Yes, that’s the right word. Rain, rain and more rain. Between the mold allergies and the spring hay fever, I could buy stock in Benadryl. Nothing else works. I spent the winter in full hibernation mode. Much thanks to Alecto for getting he out of the house last weekend and for getting me out of my own head. We went dancing in Floyd. I love Floyd. It’s quirky and old and full of contradictions. Hippy clothes for sale across the street from the Old Country Store, where the music is old and live every Friday night and Sunday afternoon. The Old Schoolhouse fabric shop that is the old Floyd school and is very much like the building that was the main schoolhouse where I met CG way back in 4th grade. And thank heavens for the Blue Ridge Restaurant and cheeseburgers and homemade coconut creme pie. Contra dancing was putting me way outside my comfort zone, on multiple levels. That feeling lasted until about 5 seconds into the first dance. After that, it didn’t matter. All that did matter was the count and the music and remembering what to do next. And if I forgot, it was OK. I lived, none of my partners got injured, and my foot only got stepped on once. There are several contra dances in my area and I will be going to them, partner-less since spinning makes Hubby turn green and get very dizzy very fast. I’m still addicted to glass breaking. I started getting low on certain colors of glass, so I put an ad on Craigslist looking for glass and supplies. I love Craigslist. A nice man from Greensboro called me and said he had several hundred pounds of glass, plus some tools, that he wanted to get ride of. I offered to drive over and take a look, but he said he was getting ready to move and would have to pull everything out anyway and how about if he just put it all in his truck and drove it to my house so I could look? He did, and I did, and I bought about $2000 worth of glass for $200. A week later he called and said he had found some more glass and he would just drop if off in my driveway. And he did. Part of the weekend with Alecto involved a visit to my Dad’s grave. I took the first piece of glass I made, a red tulip made from one of Daddy’s patterns, and left it for him. A couple of days later I learned that my aunt had gone by the cemetery after we left, found the glass, and took it home. I’m glad she did. It’s Saturday and there are things I should be doing. Think I’ll go break some glass. I (obviously) haven’t had much to say here, but I’ve been kinda busy. Well, busy for me, anyway. The driving job comes in waves; I’ll go for two weeks with no assignments, then I’ll get 5 in 3 days. Looks like I’ll be spending most of this week with one client. The job really is perfect for me. I drive, I spend time reading or doing errands, I get to help people out. Everyone who uses this service is on workman’s comp, and every person I’ve met has said the same thing: I wanna go back to work. After thinking about it a little, I realize that I’m channeling Daddy. He was a salesman with a territory, so he drove a lot. No, I’m not selling anything, but I am definitely driving a lot, and learning things about where I live, like how to get from my house to High Point without using the highway, or the exact location of Archdale and Trinity. But the REAL channeling started a couple of weeks ago when I decided to take up a new hobby….working with stained glass. Daddy started with a lampshade kit and a community continuing education class. There must be a hundred sheets of glass in my basement. Daddy had big plans, I suppose. Seemed kind of silly to have all that glass, and the equipment to work with it, and not use it. So a couple of weekends ago, Hubby and I pulled out all the equipment and found enough supplies, like copper foil and flux and soldering irons, etc. to last quite a while. 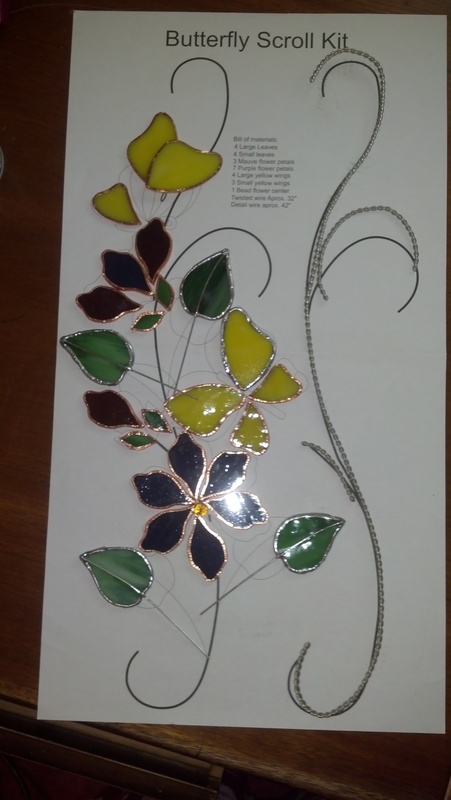 I went online and found a beginning stained glass book, watched a few videos on Youtube, and ordered what I thought would be an easy kit. Well, turns out I probably chose the most difficult type of work to solder. It’s a sculpture sort of thing, a twisted wire about 18 inches long, with butterflies and flowers soldered together then attached to the wire. It has issues. I moved a desk lamp in, so I can see much better. But it won’t do once I start actually cutting glass because there’s carpet under that desk. No glass dust in the carpet. Yesterday I finished tinning all the pieces and realized that there’s probably no way I’ll ever get this project finished. At least not any time soon. I was supposed to use U-channel lead, not foil and solder. Lead would have been much easire to work with, since the only thing that would need soldering on each piece was the joint where the lead came together. And I need lead to give the poor butterflies some bodies. AND lead would be easier to solder to the twisted wire that holds the sculpture together. Note to self: when the instructions say “use U-channel lead”, do what it says. 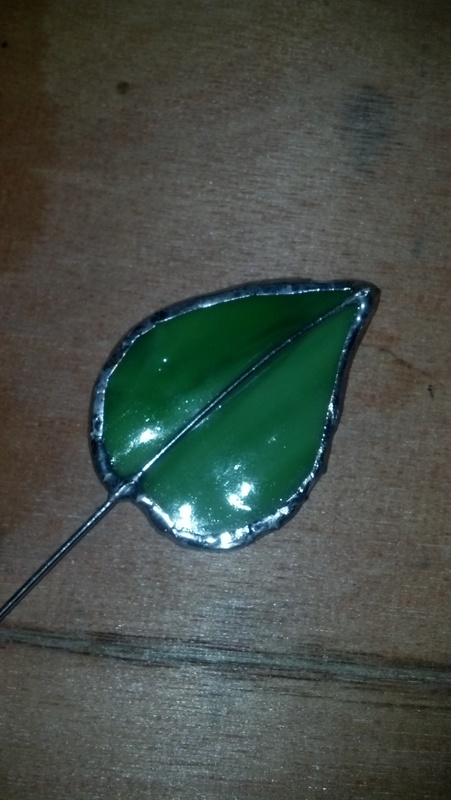 This could have been relatively easy, but in my zeal to get busy with glass I made it REALLY hard. 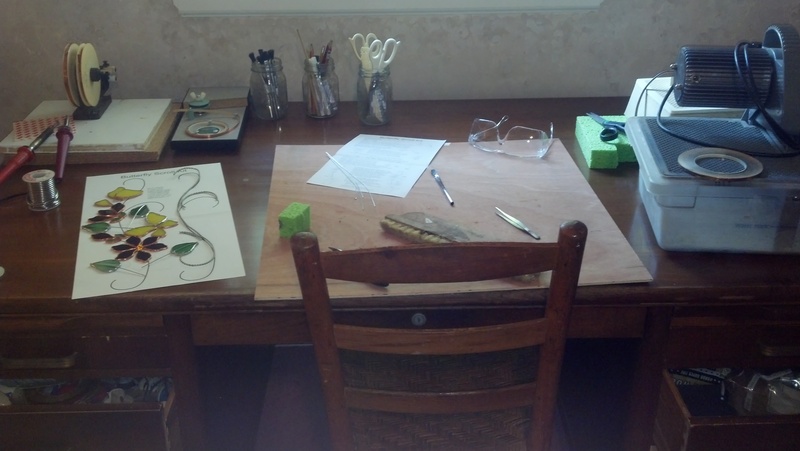 Once I realized the error of my learning ways, I got back online and found a beginning beveled glass panel. Everything is cut except for the corners of 4 squares that need to be cut away. Four straight cuts. I can manage that. So the sad butterflies and flowers will most likely get chalked up to live-and-learn. I’m a silly perfectionist, so it’s hard to put that aside and let the first piece go unfinished. The more I think about it, though, the easier it gets to leave it and move on to something else. I would like for the first piece I finish to be something I could actually SHOW to someone else, and that certainly would not be the case with the sculpture thing. So, I’m going to the beach, and when I get back I’ll have something new to start with that will have a better chance at seeing completion. Who knows? Maybe I won’t be able to cut it, being a glass crafter. Ha! Cut it….funny. On the other hand, I may be able to put all that glass to good use. Maybe there’s just enough of daddy in me to get past the fear of failure and do something new. I won’t really know until I give it a real try.